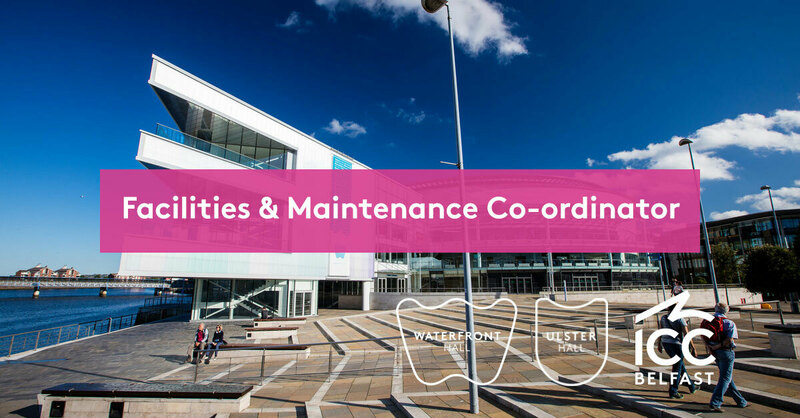 We are currently recruiting for a Facilities and Maintenance Co-ordinator to join Waterfront Hall, Ulster Hall and ICC Ltd team, you are to ensure that all buildings are fit for the delivery of events as planned and that customers’ experience of an event is exceeded through the provision of surroundings presented to the highest standard. To advise on requirements for and to oversee the work of contractors supplying or using temporary power for events and conferences. Where appropriate, to carry out installations of this nature; this includes oversight and approval of method statements and Health and Safety requirements. To ensure working procedures are current and up to date with current Legislations i.e. BS 7671, and BS 7909 - Temporary Electrical Installation in venues, where appropriate. To assist the Facilities Manager in the management of Health & Safety for the buildings, and to carry out regular Health & Safety inspections. To liaise with, and assist as directed the operations team in the day to day delivery of a broad range of events, all maintenance including floor power services for events. To apply for this post, please download and complete an application form and email to hrinbox@waterfront.co.uk; or by post to; HR Team, Ulster Hall, 34 Bedford Street, Belfast BT2 7FF. Closing date for applications is 07 May 2019 at 12.00pm.